I’m back with another meal prep idea for you all! I’ve received a lot of feedback on these types of posts, and it turns out, a lot of you love this whole meal prep thing. What’s not to love, really? I plan to keep doing these at least once a month, maybe more! Today’s meal prep is in the form of breakfast! Woot! I know I have talked about this before, but I am not a big breakfast eater. I LOVE breakfast food, but I am not interested in eating until almost 10 AM most days. I am far more interested in coffee first thing in the morning, followed by a little stretch of time before I even think about food. Dan, on the other hand, wakes up famished. Every single day of his life. Kieran has inherited this from him. Maybe it’s a guy thing? Shrug. On the weekends, I get up first and enjoy a cup of coffee in the quiet (my favorite time of day, really). An hour may go by before Dan or Kieran wake up, but when they do, I know that breakfast is first up on the agenda. I am usually not ready yet to eat, but we make it work. Today’s recipe is sort of inspired by this conundrum. I give you breakfast burritos! 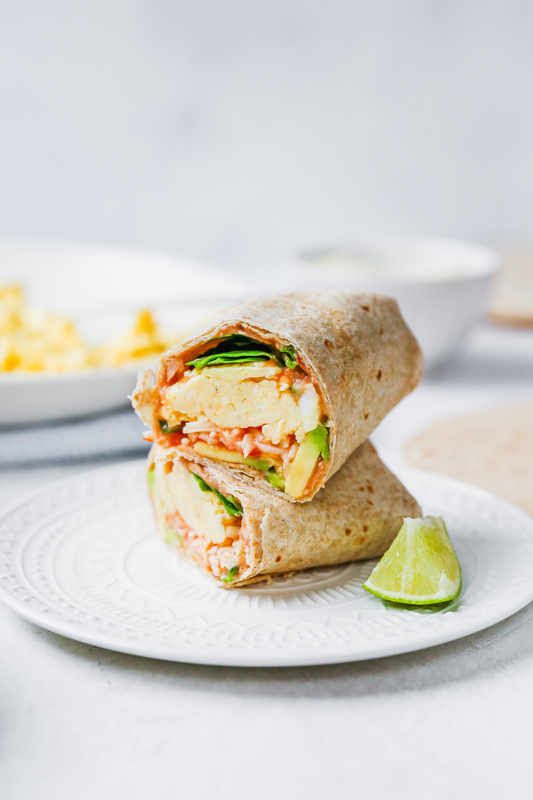 That you can make ahead and store in the fridge or freezer, for whenever you need a quick breakfast at home or on the go. I absolutely love this idea. Especially because I can give my oh-so-hungry husband one as soon as he gets out of bed, while I still sip on the last few drops of coffee in my mug. 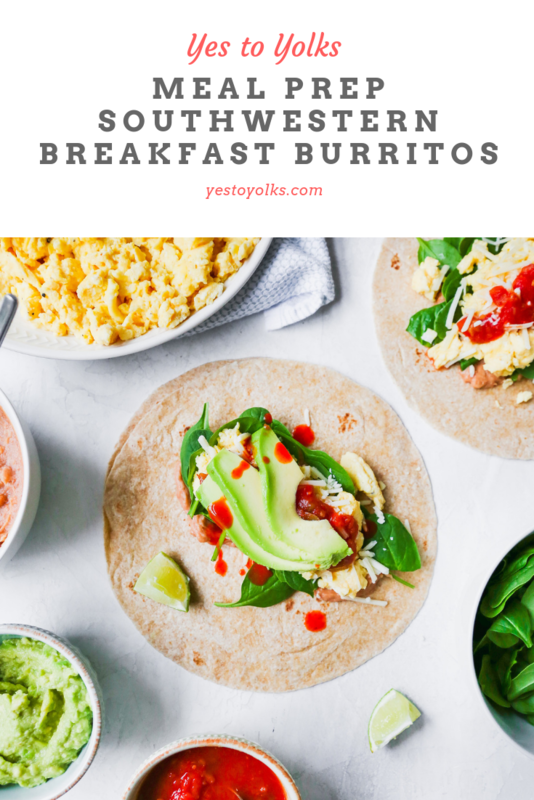 Here’s the thing about these breakfast burritos: they’re a cinch to make AND they hold up super well for several days afterwards. I think the layer of refried beans (from a can, mind you. Keeping things simple.) 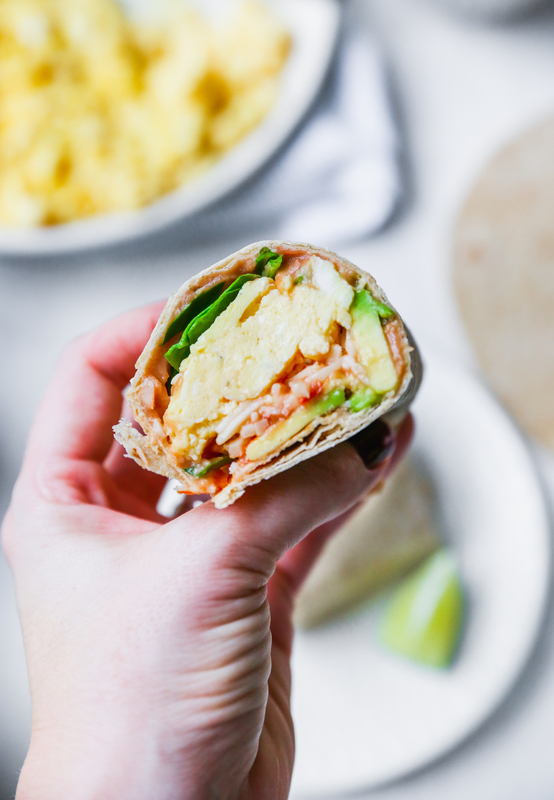 really helps keep the tortilla from getting soggy, like it might if you just went with a straight egg layer. 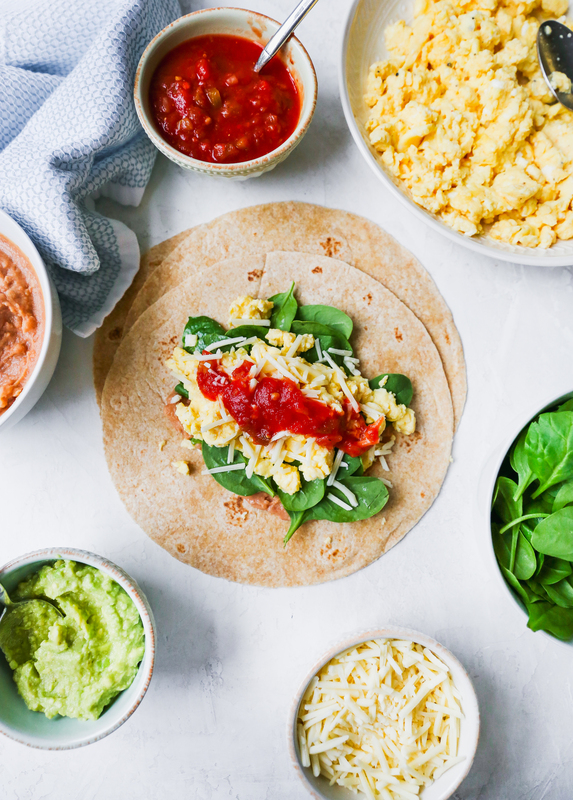 I like to do these on a Sunday, when I have time to cook up a huge skillet of scrambled eggs (bonus: I can feed my two hungry boys at the same time I’m prepping these burritos for the week) and assemble all the things. 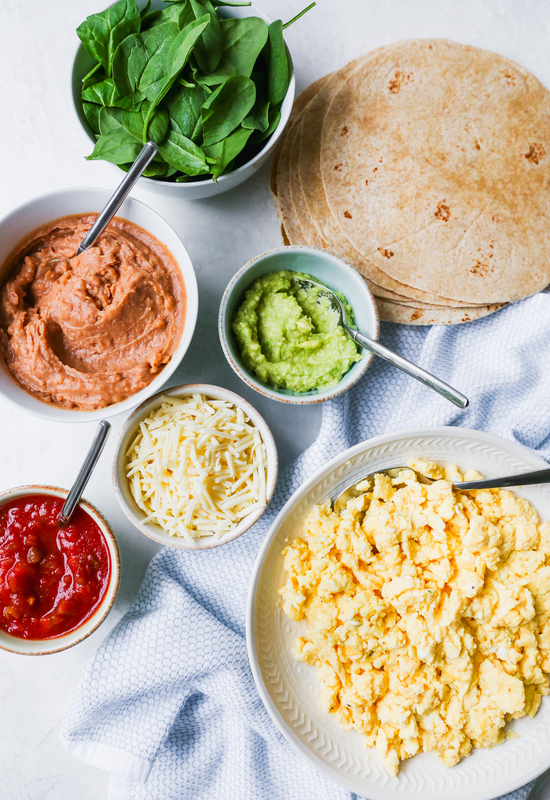 To keep this as easy as possible, I recommend getting all your layers set up to form an assembly line before you start putting the burritos together. It makes it come together SO much faster. I cook the eggs and let them cool a bit. While they’re cooling, I get the tortillas, spinach, beans, cheese, avocado, and salsa all prepped and set up in a row. Then, when the eggs are cool enough, I can roll out 8-10 burritos in about 10 minutes flat. Now, that is some easy meal preppin’, if I do say so myself. After they’re all formed, I wrap them individually in tin foil. If they’re going in the freezer, I also do a layer of plastic wrap. I pop them in a freezer bag with a label and into the fridge or freezer they go. Breakfast is prepped for several days (or ahead – for whenever you need them out of the freezer). Not only are these easy (how many times have I said that so far in this post? ), they taste AMAZING, and are very filling. One of my pet peeves with breakfast (cereal, in particular) is that I often feel hungry an hour or two later. Like, what was the point?! Haha. Not with these, though! I ate one of these immediately after these photos were taken, and it kept me full for almost FIVE HOURS. I was pumped, haha. They are a great mix of fiber, protein, and healthy fats. Also, because I know people will ask, you can customize these with your favorite breakfast ingredients! This version is vegetarian, but I KNOW some bacon would be fabulous here. Or some crumbled sausage, if that’s your thing. Sauteed veggies? Go for it. Even some crispy potatoes would be fantastic. 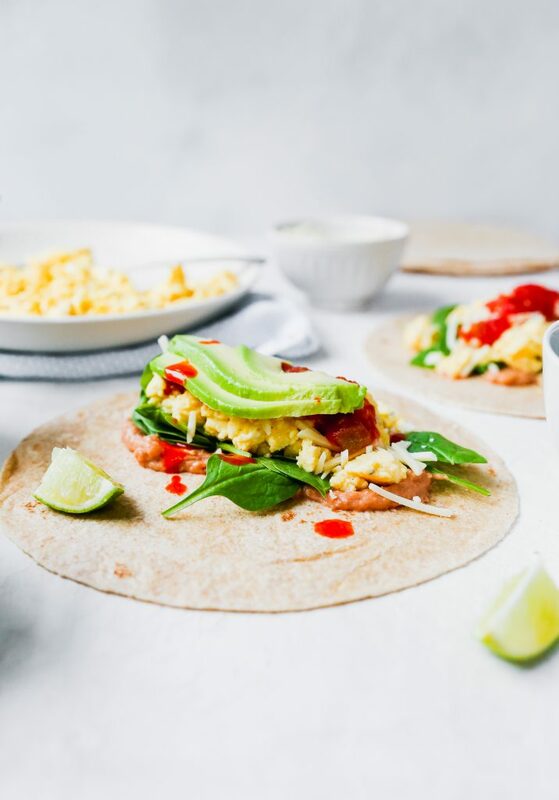 However you decide to fill these, I think you’ll love the convenience of a hearty and healthy breakfast that is ready in minutes with no actual cook time when you’re on the go (or so hungry upon waking that you are going to faint). I think I’ll even go so far as to declare this concept a gamechanger. Whisk the eggs with the milk until frothy and well combined. Season with a little hot sauce and pinch each of salt and pepper. Pour the eggs into the skillet and cook over medium-low heat, stirring frequently, until scrambled, fluffy, and cooked through. Set out all your ingredients for easy assembly. Place a tortilla in a square of aluminum foil large enough to hold the formed burrito. Smear a couple tablespoons of the refried beans on the tortilla. Top the beans with roughly ¼ cup of the baby spinach. 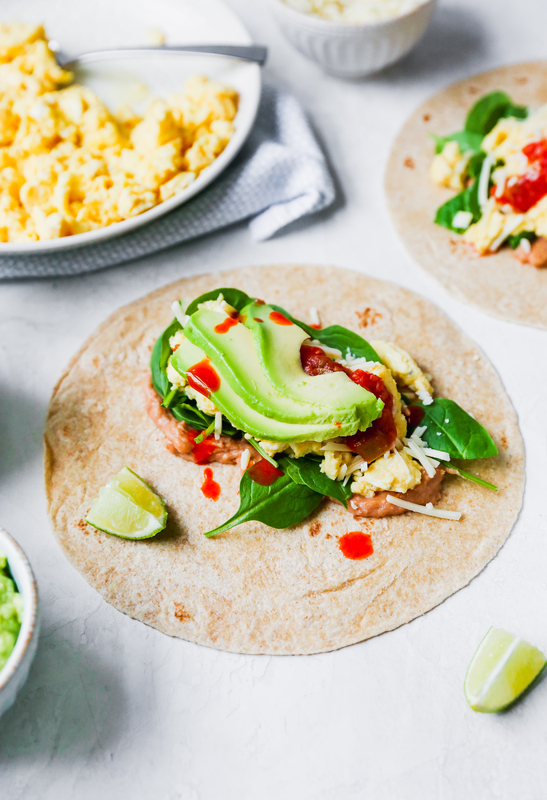 Top with roughly ⅓ cup of the eggs, ¼ cup of the cheese, a few tablespoons of salsa, and a few tablespoons of the mashed avocado. Season with a couple more dashes of hot sauce, if you like things on the spicier side. 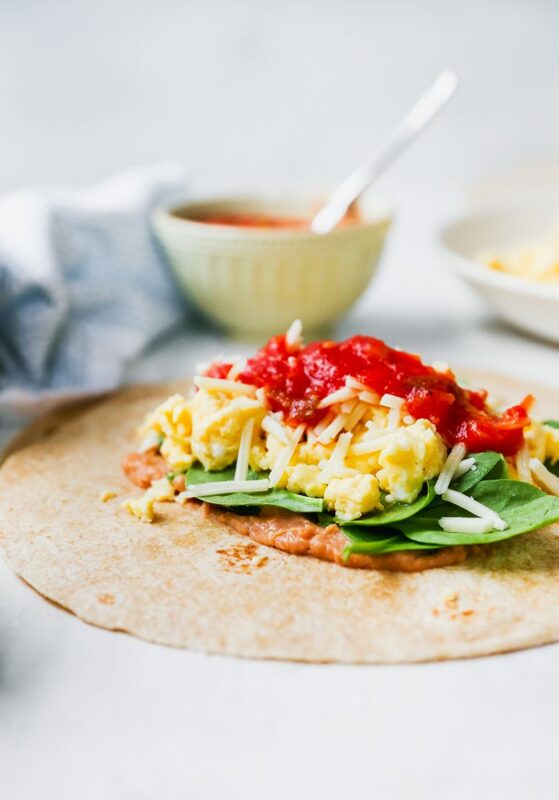 Roll the tortilla up tightly, tucking in the sides as you roll. Place the tortilla seam side down on the aluminum foil and roll up tightly. 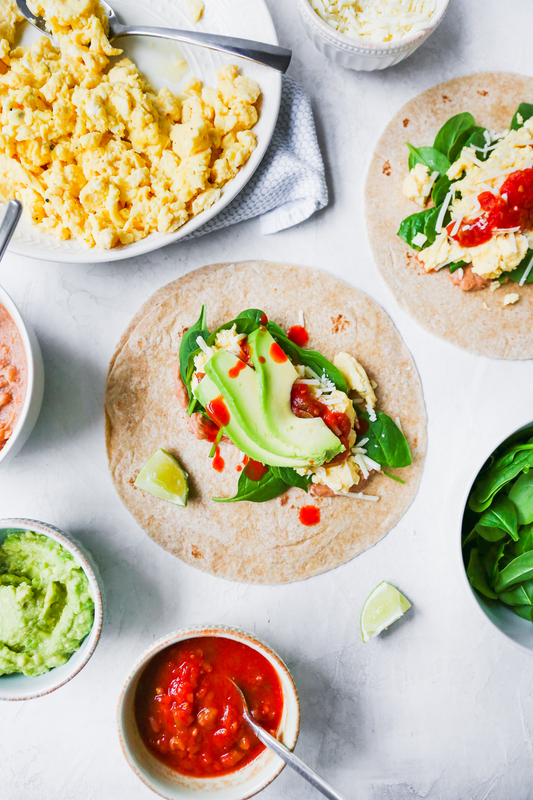 Store in the fridge for a few days OR wrap each burrito well with plastic wrap (on the outside of the foil) and place in the freezer for up to a month. For refrigerated burritos, unwrap, place on a plate, and microwave for 1 minute. Cool slighty, slice in half, and serve. For frozen burritos, unwrap, place on a plate, and microwave on low/defrost for 3 minutes, stopping to turn the burrito over every minute. Microwave on high for an additional minute. Cool slightly, slice in half, and serve. If you are serving these immediately or straight from the fridge, I recommend doing so with sliced fresh avocado, rather than the mash. This is just my preference, as far as texture goes. Also, the avocado mash is likely to turn brown in the fridge. The mash holds up really well in the freezer, though, for those of you who may be wondering. The lime juice and lack of air exposure helps keep it green.